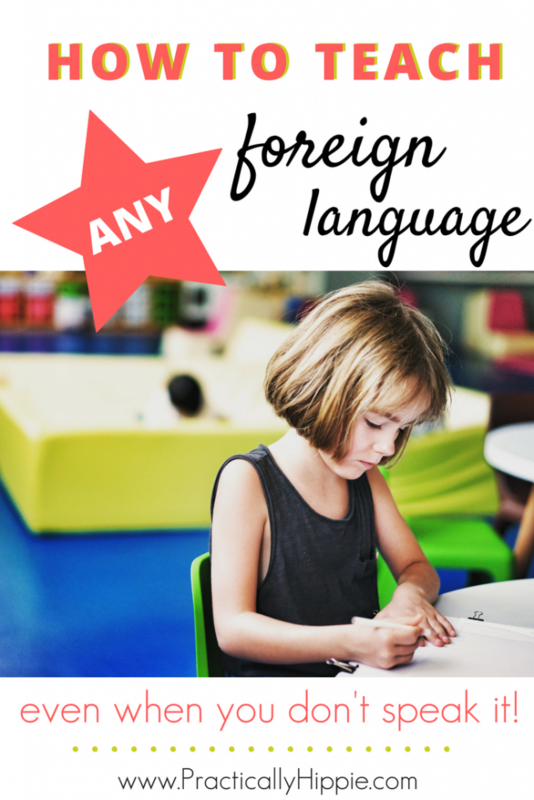 Want to know how to teach a foreign language when you don’t speak it? Find out how to learn new vocabulary and use songs, stories, and more to gain fluency. One of my biggest regrets in life is that I didn’t try harder to learn Spanish growing up or as a young adult. Three out of four of my grandparents spoke Spanish as their first language, and my grandparents on my dad’s side never spoke great English so we never really got to communicate through words. My dad’s first language was Spanish, and my mom learned Spanish and became fluent when I was very young as she worked closely with the migrant population. But me? I just never could pick it up. Sure, I took Spanish classes in school. I even took enough CLEP tests to get me 12 hours of Spanish credit when I went to college. Yet I couldn’t speak a word of it! After I got married, I enrolled in a local program run by a branch of a university in Mexico that brought in teachers who only spoke Spanish to teach classes while they learned English. These classes were small, interactive classes that focused a lot on conversation, yet two years and thousands of dollars later, I still couldn’t carry on a basic conversation in Spanish! What’s wrong with foreign language education today? Why was learning Spanish so hard for me? I can see now that the whole system of teaching foreign languages is inept at actually teaching people to speak a new language. I have a huge repertoire of vocabulary. I can tell you all about parts of speech, tenses, gender, regular and irregular verbs, and grammar rules in Spanish. I have great pronunciation and can read in Spanish quite well. But all of that is useless unless you can put it together to actually have a conversation with someone. The way I see foreign language being taught and its pitfalls actually is quite similar to the way the modern education system teaches other subjects too. With an increased focus on testing and results, many children miss out on going past superficial exposure to topics to where real, deep learning takes place. It’s unfortunate, but all too common. It’s the same reason why I made an A in AP Calculus in high school yet I can barely add two-digit numbers without a calculator. Teaching a foreign language when you don’t speak it yourself isn’t easy. But it can be done! It’s a process of learning yourself as you go and sharing with your children. It’s often said that children learn languages more easily than adults. Gabriel Wyner of Fluent Forever dispels that myth in his awesome TEDx talk. Once we realize that it is possible for us to learn a language alongside our children, we have to decide the all-important matter of how. I read the book Fluent Forever, and instantly knew that this method would actually work. The Fluent Forever method focus on training the ear and pronunciation first. It uses the power of word association and real memories to give meaning and life to foreign words so that you’re not translating words, but actually thinking in the new language. I began using this method by downloading the Fluent Forever pronunciation trainers, and began to train my ears to the rhythm, cadence, and intricacies of how naive speakers use the language. Even though I grew up around many Spanish speakers, I was still surprised at how valuable this was. Teaching a foreign language to children will require that you as the parent speak the language too. You will absolutely want to bring in supplemental material where the child can hear native speakers as well, but there is no getting around that you will have to use the language for your child to learn it. You want to ensure that you have the best pronunciation possible before you begin. Her students began informal French lessons at home as babies and toddlers and by third grade they were speaking fluently and beginning to write in the second language. By the end of their schooling, they were speaking, reading, and writing the new language as if it was their first. Charlotte Mason encouraged the use of the Gouin series as an essential part of learning a foreign language. Named for its creator, François Gouin, a Gouin series consists of students learning to narrate everyday activities into the new language. Students perform the activity while saying the words forming a brain-language connection that they won’t easily forget. Once the student has learned the vocabulary in the series, it is easy to expand and add to it. The Gouin method focuses on pronunciation and speaking vs reading and writing in the younger years. Charlotte Mason also encouraged incorporating folk songs, simple games, poetry and nursery rhymes, and conversations into language learning. I’m convinced about the best way to learn a language myself, and I value Charlotte Mason’s guidance on learning a language, but putting all the pieces together isn’t an easy feat. There are so many language resources out there, and frankly, many of them aren’t worth the money and go about learning languages in the wrong way. 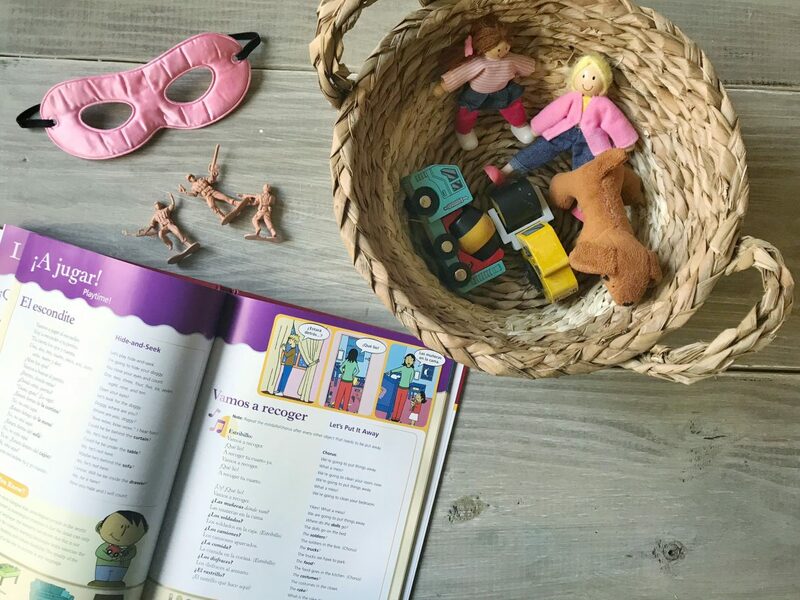 Foreign language flashcards, foreign language picture books, and many other “essential” tools have no place in this modern approach to learning languages where we want to focus on speaking first rather than reading and writing. So what do we need to teach a foreign language when you don’t speak it yourself? Unfortunately, there’s no easy answer. In my experience, effectively teaching a foreign language with an aim for fluency and not immediate recall for testing takes a multi-pronged approach. I am not an expert on foreign language or teaching, but I can share what is working for our family. My children are currently 7, 4, and 1 for reference. What I am outlining is a method that I believe in for younger children- probably under about age 9. Older children are able to assimilate more of the rules of a language and would benefit from additional lessons in grammar. Younger children are learning grammar through using the language, but we don’t need to confuse or distract them with terminology at this point. Vocabulary: New vocabulary should be relevant to the child’s life. It should be introduced through pictures and real objects. New words should be introduced in a meaningful sentence that you would actually use in daily life. Write new words and sentences down in a notebook and review often. Aim to introduce two to six new words daily. Young children should only hear the language for the first several years. Reading and writing will come later. 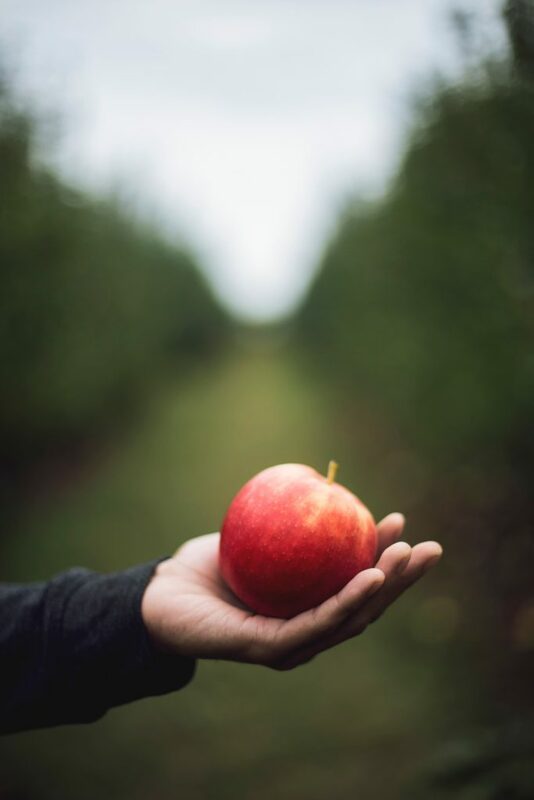 Series: Use Gouin’s method of progressive sentences paired with live action to form a connection between the words and actions and open up a world of possibilities when those sentences are expanded. Begin with everyday actions and objects forming a series of three to six sentences for each scenario. Songs & Music: Children love music and foreign language songs are invaluable in training the ear to hear pronunciation and learning the rhythm and rhyme of a language. Listen to songs in your target language often without worrying about translating the words. Spend time learning the words to one song at a time in your target language. Introduce new vocabulary as needed, but do not translate. Poetry & Nursery Rhymes: Just like in English, poetry is an essential tool in building literacy. Read or listen to a short poem in your target language every day. Introduce new vocabulary as needed, but do not translate. Games: Games bring new information to life for children. Use new vocabulary to play simple games in your target language. Stories: Read, tell, or listen to short stories in your target language. Introduce new vocabulary as needed and use props or visuals to bring the story to life. We practice our Spanish every day. Sometimes it is in a formal lesson, and sometimes we are simply using the language where we can. If my kids are reluctant to do Spanish, we turn it into a game or do a favorite song, but I make sure we are hearing and speaking Spanish every day. My oldest daughter is in 2nd grade and we do formal foreign language lessons four times each week. Words are the building blocks you need to form language. Introducing new words is not difficult, and you don’t need any special resource to help you do this. However, a great start in learning vocabulary for a new language is by looking at lists of high frequency words. This list is a fantastic compilation of the 5000 most frequently used Spanish words and I’m sure you can find lists for other languages as well. The matter of how to learn new vocabulary is much more complicated than deciding which words to learn. To prepare for a lesson, I think about what we’ll be doing, where we will be, or special holidays or celebrations and find a few words to go along with that. In the beginning, you’ll be starting at the very beginning so every new word will be new, but you’ll move through el, la, de, que, y, and the basic words pretty quickly. When you get to more substantial words, I prefer using real objects whenever possible. If an object isn’t possible (because the word is not a noun or is a noun you wouldn’t encounter in real life), a photo is the next best thing. I use a system of flashcards that we use to learn new words. I use digital flashcards for myself, but with my children I prefer to use hard copies that they can touch and explore. If you want to know more about using flashcards to learn a language, I highly recommend reading about the Fluent Forever method. I’ll summarize, but you’ll get a more thorough, and better, explanation if you browse all of the information on the Fluent Forever website. I don’t recommend the book because it’s not updated with the latest information. Creating your own flashcards is a path to get to that point. The simple act of looking at a word or phrase and finding a photo or illustration to demonstrate that triggers the creation of memories. I’m not focused on translating; this work is on a much deeper level. I do not include the English word anywhere on the flashcard. I include the Spanish word and a definition in Spanish if I need one. 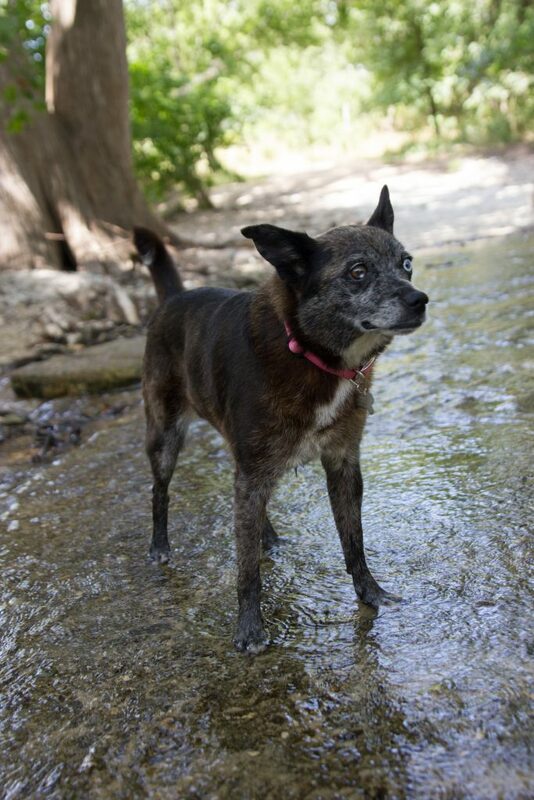 I’ve created a connection and when we hear the word “perro,” we’re thinking about our dog and all of her crazy antics. This is how you learn vocabulary without memorizing, but actually beginning to think in your target language. Would you like to read a book? There is no need to literally translate sentences or phrases word for word. We’re not trying to translate our world into a new language; we’re trying to teach our children to think in a new language. The act of creating flash cards is essential in triggering memories to imprint the language for the long term. There isn’t any resource out there that can replicate that process. But if your family is learning Spanish, I am sharing a set of some of our flash cards that might be useful to others in getting started. 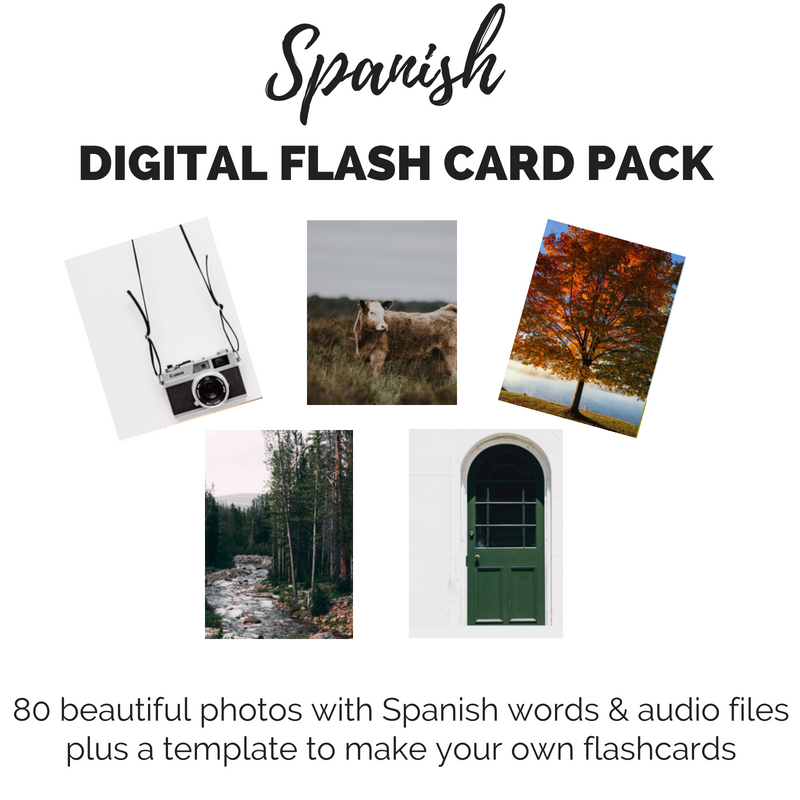 Purchase your Spanish Flash Card Pack here. So now for the big question…how do you learn the words, phrases, and sentences to teach your children if you don’t speak the language? You need to find someone who speaks you target language! Finding a native speaker will propel your language studies forward faster than any other resource. If you cannot find someone local, find someone you can video chat with. If you don’t personally know anyone, I have used and LOVE italki.com to find a tutor. I virtually meet with my tutor about once a week for 30 minutes and go over a list of words, phrases, and sentences I want to learn and teach my children. This process is fun, creates memories so that I am actually learning the language, and gives insight into word choice and connotation that a dictionary could never give. My tutor types everything up and sends it to me after our session along with an audio recording. All of this for about $5 a session! There are also free options if you trade off and help another person with English. Our family is learning Spanish, and I’m happy to share what we’re using and what works for us. This is by no means a list of the only resources that can serve the intended purposes as so much about learning language in this way is adapting it for your own family’s needs. This book has so-so reviews but that is due to the useless CD included with the book. The CD has audio of the conversations in the book, but does NOT include the songs. It instructs you to open the folder to play the songs…a little hard to do when I’m driving in my car! But thankfully, the author responded quickly to an email and sent over an iTunes link with all of the songs. This book includes sample conversations, vocabulary, songs, games, stories, and so much more! The book is organized by themes, but I like that each lesson is not so narrow that you’re learning all about food or all about pets. Just as an example, I’ll share about one of our first lessons that my kids love. The lesson was about playtime and includes a song about cleaning up. Before the song, I introduced the names of some toys: dolls, trucks, costumes, solders, etc. Then we made a mess with the toys and listened to the song to clean up. We learned new vocabulary, trained the mind to remember it with the action of cleaning up, and had tons of fun! The audio is not great, and I definitely wouldn’t solely rely on this to practice pronunciation. The songs are not the best either, but they work. Even with the mediocre CD, I would highly recommend this book for anyone with young children. This book and CD are fantastic for learning folk songs. The singer is engaging and fun, and my kids love every single one of these songs! We are obsessed with Elizabeth Mitchell, and this Spanish album is just as beautiful as her English ones. The songs are catchy and sweet, and we can’t get them out of our heads…which is a good thing when you’re trying to learn a language! This Charlotte Mason resource lays out Spanish using the Gouin Series. Used in combination with learning vocabulary through sentences and flash cards, poetry, and songs, this is a valuable resource. As a standalone resource, it can seem quite dry and boring, but we tend to do this only every other week or so to keep it fresh. This thrift find has been a great way to add poetry and rhymes to our Spanish lessons. I wish there was audio to hear the songs, but I’ve been able to find many of them online. From my research, the absolute best way for children to become bilingual is for at least one parent to use the non-dominant language exclusively at home. If you have the ability to speak the language, use it as much as possible! Children will learn English from the world around them, and they will learn to seamlessly flow between the languages. Your children will thank you for this gift when they are bilingual in our multicultural world. This approach to learning a language will work for ANY language. It does take work, and won’t be an open-and-go approach to teaching. But if you are serious about teaching your children a foreign language, the extra work you put into it will pay off because you will undoubtedly learn the language yourself and give this wonderful gift of language to your children. Excellent article. Also, keep an eye out for ways to get involved in activities or situations with people who speak that language. Just what I was looking for! Thank you for sharing your foreign language learning journey! Great post! Thank you for this information. Thanks for reading, Sarah! Hope you are able to incorporate some of these resources into your own home.